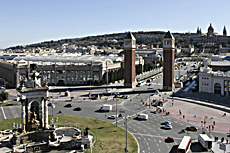 The GlobalGEO Fair will take place in the Monjuic Venue, Hall 6 at Fira de Barcelona exhibition center in Barcelona, Spain from March 15 to March 17. The fair features the latest products for GPS navigation, 3D mapping, geographic information systems, photogrammetry, teledetection, geodesics, topography, satellite navigation, intelligent transport systems and communications. The event includes the 9th International Geomatic Week scientific symposium. Of particular interest to Inside GNSS readers is the Tuesday, March 15 symposium on Geodesics and Navigation. It will cover the latest advances in navigation, global positioning, geodesics by satellite (GPS, GLONASS, EGNOS, Galileo) and systems for improving GNSS signals. The GSA’s Carmen Aguilera will speak on these topics at the plenary session. She is research and development officer for market development at the European GNSS Supervisory Authority. International Geomatic Week is organised by the Geomatics Institute and the Polytechnic University of Catalonia with the collaboration of Fira de Barcelona.